The first health benefit of flax hull lignans is that they act as powerful antioxidants to help reduce free radical damage. In very simple terms a free radical is an atom or molecule that is missing an electron in its outer orbit. This makes it extremely unstable. Because of this it will try to steal an electron from a different atom or molecule to stabilize itself. This process causes the affected atom or molecule to become unstable and develop into a new free radical. This begins a chain reaction that can cascade until the final free radicals steal electrons from the cell membrane of some tissue resulting in damage to a living cell. This constant process of free radicals stealing electrons from living tissue results in the aging process we all experience. An antioxidant is a molecule that freely gives away its outer electrons. Thus, it will give the free radical its needed electron to return it back to a stable compound. Now, you might be thinking that the antioxidant will become a free radical. Here is the really impressive aspect of this process. An antioxidant doesn’t become a free radical because they are stable in either form (with or without an even number of electrons in their outer orbit). The stability of antioxidants allows them to act as free radical scavengers to help prevent cell and tissue damage. And flax hull lignans are an excellent source of antioxidant protection. For more information on the health benefits of flax hull lignans for the prevention of these types of cancer, please click here. Lignans can help to alter estrogen metabolism is a positive way to help maintain proper hormonal balance. Lignans help to support the immune system to provide protection from colds and flus. Lignans support the growth of good gut microorganisms to help improve gut health. Lignans provide soluble fiber to help stabilize blood glucose, which can aid diabetics with better insulin response. 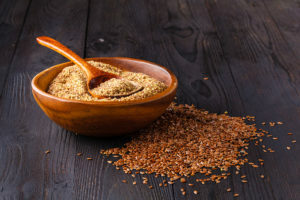 And flax hull lignans are a great source of plant-based omega-3 fatty acids (called alpha-linolenic acid) to help reduce inflammation. Personally I’ve been using flax hull lignans for several years as a way to protect myself from melanoma, which is a skin cancer I had 7 years ago. And while there are several flax hull lignans on the market, I use a product from Flax Lignan Health. I add one scoop of their flax hull lignans to my morning ORAC shake. If you’re interested in this product, then please click here for more information.